The cost and risks of coming into compliance with county ordinances and state laws has deterred a lot of the Emerald Triangle’s underground growers from choosing the path to legitimacy. With a larger and more lucrative black market beckoning outside of California, many cannabis farmers have opted to continue operating outside the law by exporting their product. In order to become a licensed grower in California, there are various agencies one must seek approval from. One has to take all the necessary steps to obtain local permits (including payment for legal and licensing fees); register fingerprints with the state Department of Justice; submit proof of compliance with the California Environmental Quality Act (CEQA); submit cultivation, business and environmental plans, proof of ownership or right to use the cultivation space, any streambed or water alteration plans; implement a technically complex track-and-trace system; get a seller’s permit from the state, and more. Securing local and state licenses to cultivate cannabis is costly. And even after small growers pay for the property improvements, lawyers, architects, land use and permitting experts, and licensing fees, many will find themselves taxed out of existence. Under California’s new tax scheme, growers are taxed by the state at a rate of $148 per pound of cannabis flower and $44 per pound of cannabis leaves. In many places, growers pay an additional tax to the city or county of $25 per square foot of garden space. Costs cannot simply be passed onto the consumer. Customers—both medical and recreational—are already being squeezed at the register. The state has imposed a 15 percent excise tax on all cannabis products. Several cities and counties have imposed an additional local tax that’s as high as 15 percent. California sales and use tax, which ranges from 7.5% to 10%, is then applied not just to the retail cost, but to the excise tax as well (in other words the excise tax is taxed). What’s more, cannabis businesses may be penalized an additional ten percent if they pay their quarterly tax installments in cash! Given that banks aren’t supposed to service federally illegal marijuana companies, cash is the only viable option for the cannabis industry in California at this point. The Los Angeles Times estimates the high rate of taxation could lead to retail prices going up 70 percent in 2018, thereby ensuring that the black market will persist as an alternative for cannabis consumers as well as producers. The challenges facing Mendocino farmers, according to Foster, are magnified by inconsistent county and city rules across the state and the current supply glut that is causing a sharp decline in per-pound prices. Taxes do not adjust with the price the supply is sold at. The 2017 fall harvest brought the lowest prices in the legal medical market yet, with some growers saying they are unable to move even their top shelf at a break-even price. It is typical for growers to wait until post-harvest prices start to rise again before moving their product, but many are expressing concern they won’t be able to move it at all. Concerned about the adverse environmental impact of Green Rush grow-ops, Mendocino and Humboldt have implemented measures to limit the size of gardens and the number of cultivation licenses given to those who were in the area before legalization. This approach, however, has made it very difficult for the region’s responsible growers to compete with better funded, large-scale industrial farms in other parts of California and the booming black market. In Mendocino, for example, the largest garden size allows for a total of 22,000 square feet (including walkways and spaces not utilized for growing). A few hours south in Salinas, the agricultural town best-known as the setting for John Steinbeck’s novels, Monterey County regulations allow huge cannabis cultivation operations. Harborside Health Center, one of the largest and highest-grossing cannabis dispensaries in the world, recently shifted from sourcing most of its supply from smaller medical farmers and producers to its own 47-acre farming operation in Salinas. “How are we going to be a weed county if we can’t even grow a whole acre of cannabis?” asks Foster, who lives in the Mendocino town of Willits. Foster grew up in the world of marijuana cultivation and activism before the Green Rush and has been employed in the cannabis industry for most of her life. Her father, Will Foster, was arrested in 1995 for growing cannabis in his Tulsa, Oklahoma, basement to treat his degenerative arthritis. In 1997, he was convicted and sentenced to 93 years in prison, generating national coverage and outrage. During Will’s incarceration, Anna moved to Oakland, California, where she lived and worked with author/activist Ed Rosenthal and his wife Jane Klein, who ran a cannabis-oriented publishing company and other businesses affiliated with the early Bay Area medical marijuana movement. More recently, Foster teamed up with Karen Byars, a longtime Emerald Triangle cannabis grower and advocate who has been hosting educational events to help the region’s responsible actors transition into a legal, regulated industry. After the passage of proposition 215 in 1996, Byars began to cultivate medical marijuana with an all-women’s collective in Mendocino’s Round Valley. Two decades later, when cannabis was legalized for adult use, she and Foster organized a job fair, resume-building workshops, and other vocational development services to support the establishment and growth of stable industry businesses in the region. In the past, when the cultivation scene was completely underground, successful growers would reinvest their money in small, local businesses – both by choice and because other kinds of investment required considerable illegal maneuvering. Growers spent their cash on community development, contributing to independent radio, local theater productions, and start-ups that doubled as community centers. Today, Byars is concerned that out-of-town land-grabbers and speculators betting on cannabis grows are extracting wealth from small communities in the Emerald Triangle without contributing much in return. “People are coming up here and ‘green rushing’ these communities without knowing what they are doing,” she cautioned. In the pre-legalization marijuana market, most of the money accrued to the growers. The price per pound peaked after the passage of 215. But as the medical market evolved into the post-prohibition commodity market, the economic focus has shifted from growing marijuana to processing, taxing, distributing and retailing it. In post-prohibition California, new regulations siphon much of the profits from farmers to fill the state treasury. “People are treating growers like ATMs because they know all the money is in the weed. All the middlemen profit. The farmers and consumers lose,” said Foster. Kevin Simmonds is a licensed contractor and cannabis cultivator who’s been serving the Bay Area market since 2010. Based in Santa Rosa, he struggles with lifelong pain due to arthritis, which is why he started growing medical cannabis. Simmonds uses an indoor compartmentalized grow system so that he is perpetually harvesting fresh product for dispensaries every week. But now Simmonds is also struggling with the costs of coming into compliance, the glut of growers, and the plunging price per pound – and he may not survive. It would be much easier for him to keep turning a profit if he chose to move his product on the black market, which he has no interest in doing. “It’s always been my intention to participate in whatever regulation scheme they come up with. This is it, I am stuck dealing with it and I am going broke,” says Simmonds. To become compliant with the regulations that went into effect on Jan. 1, he had to invest nearly $100,000 in his indoor operation. 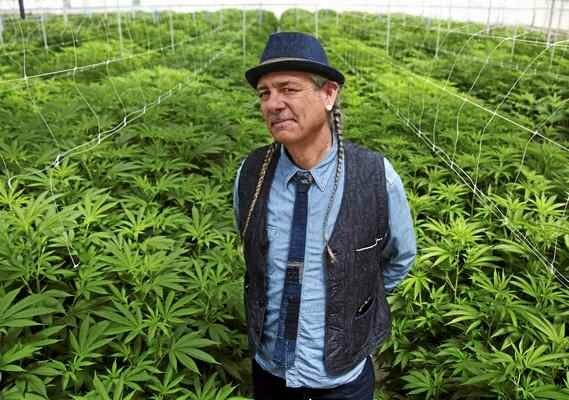 He will be taxed per square foot of his garden’s canopy by both the state and Sonoma County. Additionally, he had to front tens of thousands more to get state licensing. Meanwhile, his margins are shrinking fast as prices drop in the legal market. He is worried that with the low wholesale price, high taxes and black market competition, legalization could bankrupt him. “I have some cost projections for the coming year, and it’s going to be super tight. It is going to be a matter of if I can move all my product and have successful runs that yield well, every time. Without all those components, I will fail,” Simmonds confides. He said if he must take a significant corporate buyout to survive, he would happily do so at this point. Adam Smith has seen this scenario play out before on a smaller but significant scale in Oregon. A longtime proponent of drug policy reform, Smith has been working both to save and promote responsible, locally-owned cannabis businesses in the Beaver State, which legalized recreational marijuana in 2014.2 Ultimately, the success of these farming communities may rest upon the ability of West Coast cannabis companies to export and sell product in a legal national market and beyond. “It’s desperately important that we end federal prohibition, that we allow export,” asserts Smith. How can the indigenous cannabis industry in Northern California and Southern Oregon avoid being steamrolled by outside forces? Smith recently founded the Craft Cannabis Alliance (CCA), a membership association of cannabis businesses in Oregon that share a “commitment to an authentic craft cannabis industry that respects and serves people, place, planet and plant.” The goal of the CCA is to build an industry that benefits small producers in cannabis-reliant economies by defining and promoting “craft cannabis” and providing resources to businesses with aligned missions. Smith intends to work with growers from California and other legal states as well. As Smith sees it, the cannabis industry provides the “perfect vehicle to express a different kind of capitalism.” But steps need to be taken now at the federal level to stabilize the markets. Part 1. Eco-Crisis: Will Cannabis Legalization Save California’s Forests? Angela Bacca is a Portland, Oregon-based freelance journalist with a MBA and 10 years experience in cannabis media. She specializes in coverage of cannabis in conservative states, science, medicine, politics, business, culture and media. 1 – Original High Times magazine columnist and cannabis cultivation author Ed Rosenthal testified in Will Foster’s defense as an expert witness and advocated for Foster while he was incarcerated. Foster is free and lives in California today. 2 – Adam Smith has a long history in the drug policy reform movement. In the early 1990s, while he was attending law school at Boston University, Smith helped found DRCNet, one of the first online forums to organize national activists opposed to the drug war. “At that time, the discussion of drug policy in the mainstream media was basically a conversation between people who wanted to build prisons and people who wanted to build more prisons,” said Smith. Through DRCNet (which would later become StopTheDrugWar.org), Smith was instrumental in organizing student activists in what would become Students for Sensible Drug Policy (SSDP). After President Bill Clinton signed an amendment to the Higher Education Act in 1998, thereby eliminating financial aid for any student with any drug conviction, SSDP grew into a nationwide network with about 60 to-80 college and university chapters in its first year.